Top Ten Tuesday is a meme created and hosted by The Broke and the Bookish. This week's topic is: Top Ten -- Halloween Freebie. So I decided what better way to get into the Halloween spirit than to read some spooky books? The Dead House by Dawn Kurtagich (my review): This horror debut should be on the top of your list this Halloween. It has everything for the reader who is looking to get scared out of their wits. If only, we could read with the lights out- the atmosphere would be perfect. The Diviners by Libba Bray: Set in the 20s, Libba Bray knows how to make things come to life and creep readers out too. The Unbecoming of Mara Dyer by Michelle Hodkin (my review): I wouldn't say this one is so scary as it is creepy. Read it with friends during your Halloween scary story marathon and they'll probably want to read books two and three too. Becoming Darkness by Lindsay Francis Brambles (my review): With a tagline in German that read, "For I am eternal, becoming darkness" this one begs to be read during October. Vampires and Nazis are the perfect combination for the holiday. In this nonstop adventure, you will never need to take a candy break. The Madman's Daughter by Megan Shepherd: Heard of The Island of Doctor Moreau, meet his daughter. A retelling of sorts of an already creepy classic becomes a bit more creepy. I Hunt Killers by Barry Lyga: Into thrillers or detective shows? Jasper Dent is the son of a famous serial killer and is asked by police to hunt down other killers, using skills only killers would use. Beautiful Creatures by Kami Garcia and Margaret Stohl: Witches, anyone? Welcome to Night Vale by Joseph Fink and Jeffrey Cranor: Based on the awesome podcast of the same name, the creators are back with the weird town and weird new happenings. Nevermore by Kelly Creagh (my review): Let's mash up all the Edgar Allen Poe stories into one thing, create an alternate world and... that's the ingredients to make the scare-fest that is Nevermore. 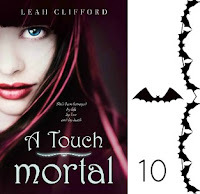 A Touch Mortal by Leah Clifford (my review): Angels aren't scary at all. But spooky houses are. And demons are definitely. Leah Clifford is at her best in this paranormal that is actually perfect for any time of the year but especially spooky during Halloween. I've read the first 3 and loved them! I still need to read The Madman's Daughter and the rest I only know of! Great picks! Dead House was SO good, you should read Devils Unto Daughters, really creepy. I have wanted to read Mara Dyer for a while, and I Hunt Killers has also been catching my attention. I've never heard of Nevermore, but your description sure does make it sound interesting! I'll have to check it out :-) Great list! The Dead House has been getting a lot of good buzz lately, it looks like an interesting read. I love books with unique formats! I also enjoyed the Diviners but I haven't had a chance to get to the sequel yet. The Madmen's Daughter is on my TBR so I'm glad to see you enjoyed it!